The parallel preparations for Intelsat 33e and Intelsat 36 are highlighted above. In the photos at left and center, the protective payload fairing is positioned and then lowered over Intelsat 33e inside the Spaceport’s Final Assembly Building – creating the upper portion of Ariane 5’s dual-passenger configuration; while at right, Intelsat 36 arrives at the same building for its integration on the launch vehicle’s core section. 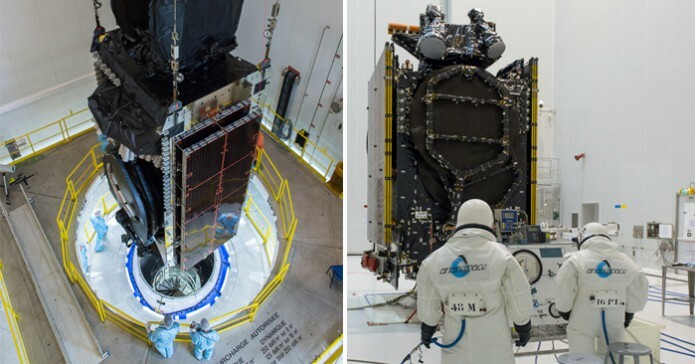 The upper portion of Ariane 5’s dual-passenger configuration is now complete, with the Intelsat 33e satellite and SYLDA dispenser system encapsulated inside their protective payload fairing in preparation for an August 24 liftoff from French Guiana. This activity took place in the Spaceport’s Final Assembly Building for Ariane 5, adjacent to where the heavy-lift launcher is waiting to receive both Intelsat 33e and the mission’s other passenger, Intelsat 36 – which was transferred into the same building from the S5 payload preparation facility yesterday. The integration process’ next step will occur when Intelsat 36 is positioned on the launcher’s core section, allowing the configuration to be completed with installation of the Intelsat 33e/SYLDA/fairing combination atop it. During the August 24 flight sequence, the payload fairing will be jettisoned first at approximately three minutes into the mission, followed by deployment of Intelsat 33e at the 28-minute mark. The SYLDA dispenser is then to be released, allowing Intelsat 36’s subsequent separation to complete the mission 41 minutes after liftoff. Arianespace’s upcoming Ariane 5 flight, designated VA232 in the company’s launcher family numbering system, is scheduled during a launch window that opens at 6:55 p.m. and continues through 7:40 p.m., local time in French Guiana. Intelsat 33e, produced by Boeing Space Systems, is the second Intelsat EpicNG-series spacecraft – following the first, Intelsat 29e, successfully orbited on an Ariane 5 mission performed in January. The satellite has a liftoff mass estimated at 6,575 kg. and will operate from an orbital position of 60 deg. East after launch. The Intelsat 36 passenger, which was built by SSL (Space Systems Loral), has an estimated liftoff mass of 3,250 kg. After reaching its target orbit, the satellite will enhance Intelsat’s premier direct-to-home neighborhood in Africa from a 68.5 deg. East orbital slot.